Inspired by President Barack Obama’s first “date” with the First Lady, the touching and inspirational romance, Southside with You is available on Digital HD, and will be available on Blu-ray (plus Digital HD), DVD and On Demand December 13 from Lionsgate and MIRAMAX®. 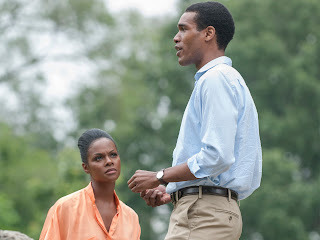 Tika Sumpter (Ride Along franchise) and Parker Sawyers (Zero Dark Thirty) “are terrifically cast as younger versions of Michelle and Barack Obama“ (Variety) in this moving look at the very beginnings of the couple we now know as the President and First Lady of the United States. From executive producer John Legend (Academy Award® winner for Best Original Song, Selma, 2015) and written and directed by Richard Tanne, this “beautiful tribute to enduring love” (RogerEbert.com) received the Rotten Tomatoes Certified Fresh rating, and was nominated for the Grand Jury Prize at the 2016 Sundance Film Festival. On a summer’s day in 1989, a law associate named Barack Obama used all his charms to woo attorney Michelle Robinson. 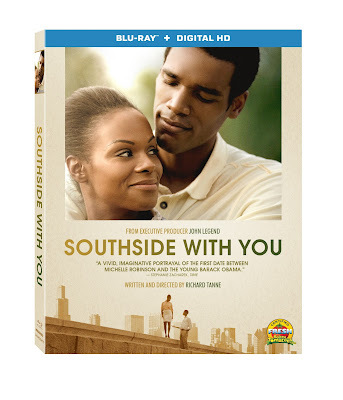 Southside with You brings that magical encounter to life as it follows Barack and Michelle on a day-long date that takes them from an art exhibit to a screening of Do the Right Thing to an unforgettable first kiss. The Blu-ray and DVD releases both include commentary with writer/director Richard Tanne and original art and animations from the film’s pre-production. Southside with You will be available on Blu-ray and DVD for $24.99 and $19.98, respectively. One person will win a Southside with You Blu-ray. JFK was one of my favorite presidents. Jimmy Carter is my favorite president. In my lifetime I liked Bush and Clinton. Two opposites, I know. Of presidents during living memory, Barack Obama. Jimmy Carter has also done a great deal of good as an ex-president, although he maybe wasn't so effective in the actual office. I loved President Clinton, but I adore President Obama. Leave a comment on this blog post with which president has been your favorite. This is tough question I think Lincoln did the most for our country. I don't have a favorite. There have been good & bad ones. Before my time, but I admire John F. Kennedy. My favorite would be Lincoln. Oh my, I don't really have one... Sorry! This looks like a very interesting movie. I thank you for featuring it for the information and the great giveaway. My favorite would be JFK. I may have been little but I always loved JFK. As far as being grown up and deciding, I would have to say Ronald Reagan.